Though I can't say I like Sasuke, when I saw this scan [by winged] I just had to wall it. Took me an awful lot of time to make it. There is still some work to be done, so I will be updating it. very nice work but a question I notice your other submissions are using almost exactly the same background. Is that on purpose? The effects on the clouds were achieved well. However, the clouds seemed to have ended at one point, and I think that they could've transcended the moon with a gradual opacity drop. Otherwise, the background is good. Keep up the good work. 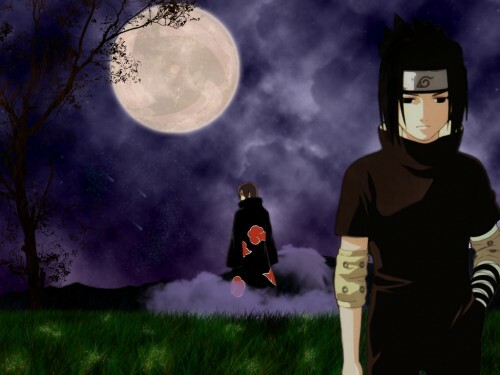 poli kalo..nice cloud effects ston Itachi..episis m'arese to Mangekyou Sharingan sto feggari..
. . . Nice wall!!! Cool background ! ! ! Aww....I love this pictures! very beautifull and emotional :D Good work! wow I love the wall... sasuke's expression is really very fitting. i freakin love it..everything is awsome..definitely one of the best sasuke wallies*fav*!